A separate department within the factory of the kiswah of the Holy Ka'bah was established to manufacture the interior curtain of the Holy Ka'bah and the Prophet's Room. The work is done manually because of the accuracy, skill and very high technical standard demanded. 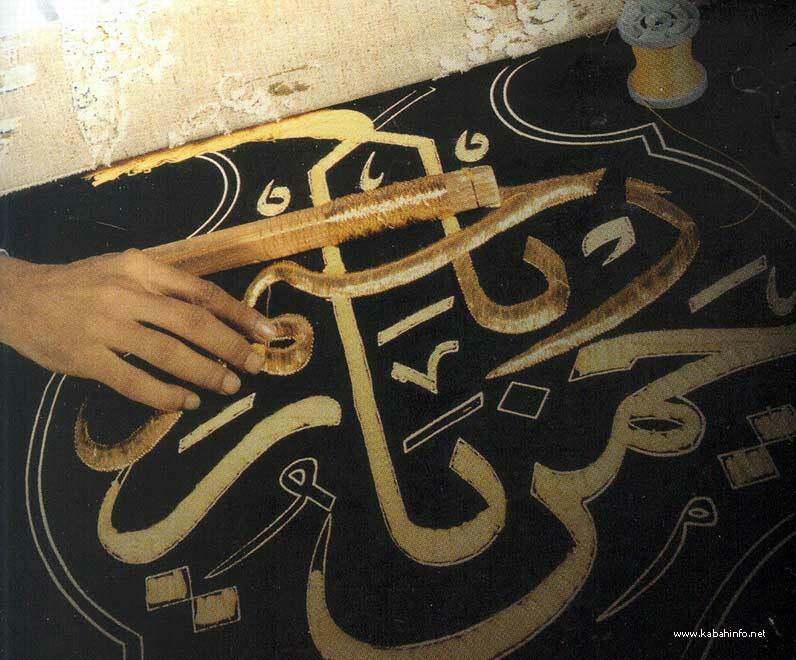 The manufacture of the interior curtain of the Holy Ka'bah passes through several stages. starting with the preparation of the silk. printing of the designs, writing on the cloth and embroidering on it, with the particular Qur'anic verses in threads of gold and silver. The belt. which sits on the upper third of the kiswah of the Holy Ka'bah. is 95 centimetres wide. Some Qur'anic verses are inscribed on it in compound. Thulth calligraphic style. 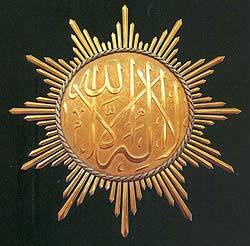 encircled with it frame of Islamic decorations. The belt is embroidered in the traditional manner with padding. surmounted b\ cold-coated. silver thread. It encircles the whole kiswah. and is 47 metres long. 95 centimetres wide and consists of 16 panels. 4 panels per side. Under the belt on each side of the Holy Ka'bah. there are two embroidered rectangular . sections and three embroidered tamps. AI-Multazam door has one large piece called the donation. making the total number of pieces. seven. in addition to twelve a lamps. 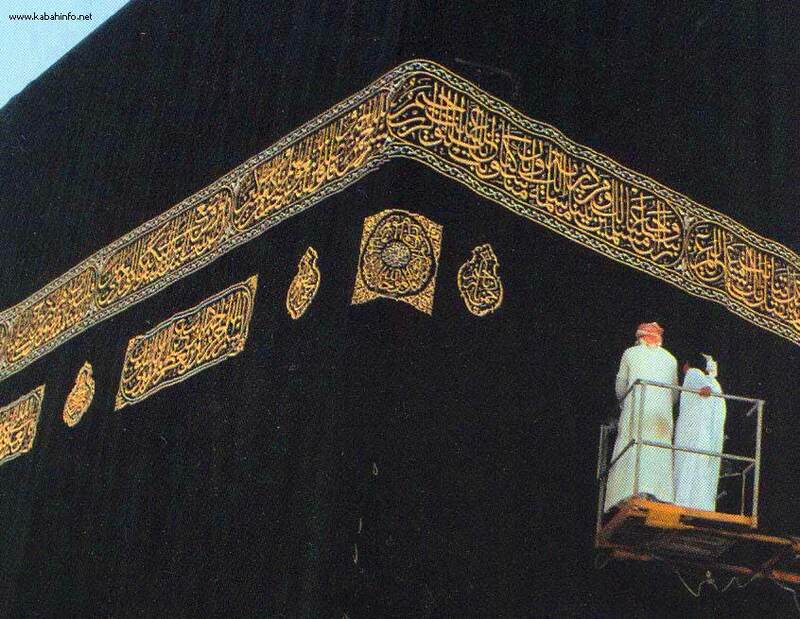 The exterior kiswah of the Holy Ka'bah. made with the utmost accuracy and efficiency. The interior curtain. done with the same exacting care. The plain. black cloth for making the belt and em broidered gifts. The plain, white and green cloth for lining the kis wah of the Holy Ka'bah. The flags of the Kingdom of Saudi Arabia in accordance with the regulations of the flag of the Kingdom. Because of the delicate calligraphic work needed for the Saudi flag, the factory's state of the an embroidery machines are used. At first. the factory used to produce only a few small gifts but the production was multiplied to satisfy the need for gifts presented to the guests of the Kingdom. using some of the Divine Names of Allah and some Qur'anic verses embroidered with gold and silver threads. The kiswah of the Holy Ka'bah with its various sections are manufactured in the factory of the kiswah in Makkah AI-Mukanramah. Work is done by skilled. well-trained. national man-power. Al-Bilad Newspaper has recently published an article in its issue of Wednesday 6th Dhul Qaidah. 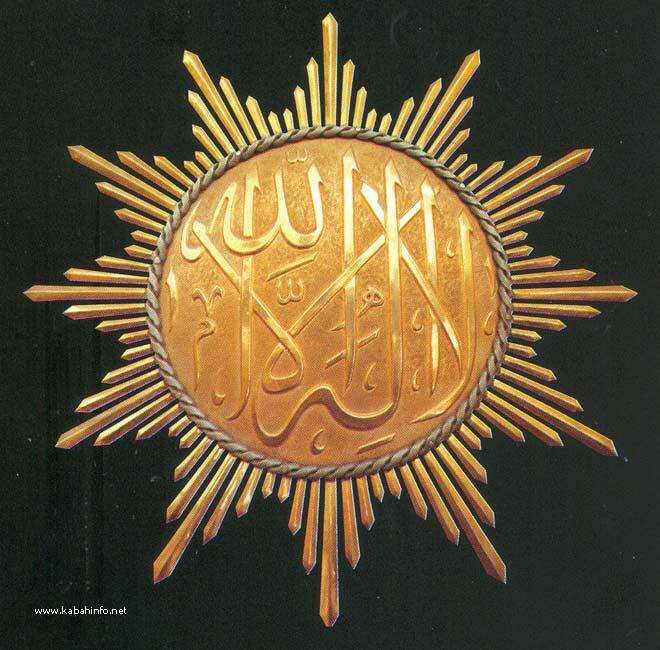 1418 H.. to the effect that the Custodian of the Two Holy Mosques. King Fahd Bin Abdul Aziz (may Allah protect him) ordered that the Kiswah Factory of the Holy Ka'bah at Umm AI-Jud in Makkah AI-Mukarrarnah should be furnished with modern machinery and equipment. This is within the domain of his desire and interest to activate the role and promptness of work in the factor) in accordance with the best technological methods. The machinery and equipment have now arrived and are being installed. We implore Allah. the Almighty. to reward him befittingly for that.